FRESNO, Calif. - The Fresno Grizzlies have changed their primary logo(s), colors and uniforms, effective for the 2019 season. The new independent look for "Growlifornia" is part of a continued branding effort by the Grizzlies to be "Fresno and the Central Valley's team." 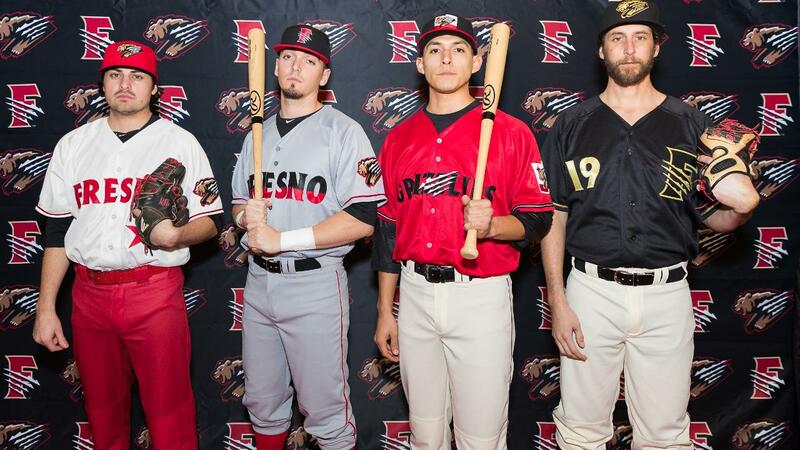 The scarlet, black, gold and beige scheme will be the Fresno Grizzlies' new permanent look. As the Grizzlies move into their second season under the Fresno Sports & Events ownership group, and entering their first season with a new Major League affiliate, the timing was right to make an adjustment to the club's identity. The new look was developed with the guidance of Brandiose, the San Diego-based firm which has helped countless other Minor League Baseball clubs transform their identities for the better. The collaboration of the new Fresno look was also led by Grizzlies' graphic designer Dorian Castro, entering his fifth season with the organization. Castro, a Central Valley and Fresno County native (Huron, CA), lent the local flair and his expertise of the region to the brand refresh. The new look for Fresno's Triple-A club builds on the "Farm Grown" and "Growlifornia" branding that has been central to the club's identity, beginning in 2015. "It's been a great four years of seeing people respond positively to the Growlifornia Flag , the "Bear Flag Rebellion," and really making the Grizzlies a point of local pride - I think you see a lot more Fresno Grizzlies apparel around town, where maybe five years ago that wasn't the case," said marketing director Sam Hansen. "So we took that framework of what makes our region special, and built an identity with Brandiose that we believe is an accurate depiction and representation of the Central Valley. Fans will notice a nod to past Grizz logos with the new marks, as well as an homage to the California flag with the home uniform." The powerful and recognizable "F-Slash" logo remains, to be used on the road cap and an alternate uniform in 2019, modified to match the new wordmark lettering. The black and gold home alternate jersey is a nod to Chukchansi Gold Resort & Casino, the incredible naming-rights partner since the 2007 season for the Grizzlies' home, Chukchansi Park. The uniform is also a tribute to past Fresno champions, both the four World Series winners in eight seasons that Fresno helped build as Triple-A affiliate (2010, 2012, 2014, 2017) and the Grizzlies' own Pacific Coast League and Triple-A National Championships in 2015. The new primary logo is featured on the scarlet primary home uniform cap. However, the new color scheme was not dependent on MLB affiliation. "We decided on colors we felt best represented Fresno and Central California, and we narrowed that down long before we were fortunate enough to affiliate with the Washington Nationals," said team president Derek Franks. "Fans can grab their new gear and not stress - these are the Grizzlies' colors moving forward. These new colors and brand are just a couple of the many enhancements fans will see when they come to a game at Chukchansi Park in this new era of baseball downtown." New merchandise is now available for purchase both at the Fresno Grizzlies Team Store, and with pre-orders online. Fans should continue to check the team store at Chukchansi Park and the online store at FresnoGrizzlies.com as new items are added in the lead-up to Opening Day. The club will start the 2019 season at home, on Thursday, April 4 against the Reno Aces (Arizona Diamondbacks), a 7:05 p.m. first pitch at Chukchansi Park.